"GMO FREE, hand made in our own mill!" I raise New Zealand rabbits for show and meat and had gotten one too many bags that were literally half dust and some that even had mold. After doing some research for local feed companies, I found Buxton Feed Co. and switched to their 16% rabbit feed. The difference has been outstanding. While some of my picker eaters (the best show rabbits of course) had completely stopped eating their old dusty Brand-X food; but they readily accepted the new Buxton Feed that I gave them. The pellets smell sweet and are obviously fresh, the rabbits really seem to thrive on them. 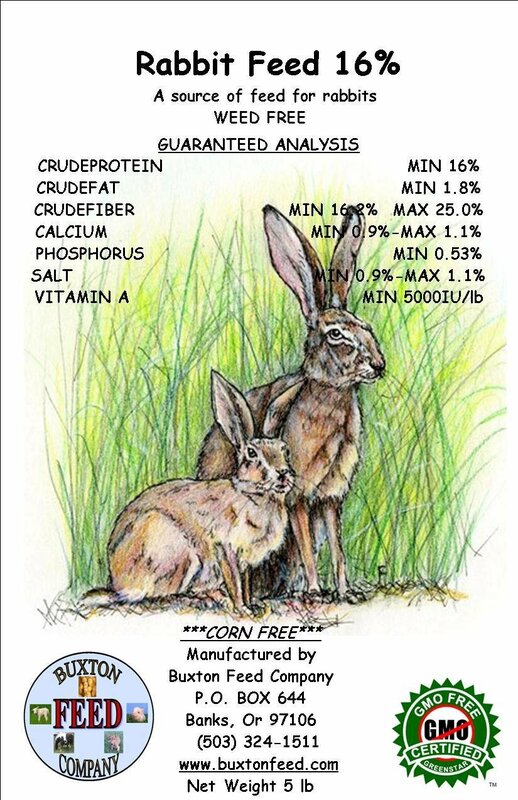 After I switched, I got more comments on the show table about the prime condition my animals were in, which I attribute to the perfect protein level of Buxton's Rabbit Grower 16% and the quality ingredients of thier feed. Most other Brand-X feeds seem to be in the 18-20% protein range and New Zealand's on Brand-X quickly get fat and flabby. My animals consistently have firm flesh and great condition to their coats when using Buxton Feed Rabbit Grower 16%. An unexpected outcome seems to be an enhanced reproductive capacity of my does as well. My rabbits started kindling much larger litters, from around 6 kits to litters of 12 and 13 kits. Even my most experienced doe had more kits survive to weaning, with zero losses in her last litter, with no conscious changes to my husbandry techniques. It makes sense, better quality nutrition helps increase reproductive success. Just being able to open a bag of feed and know it was freshly milled is great peace of mind, but knowing it is actually high quality nutrition for my rabbits that produces results is icing on the cake. I'll be buying my feed from the Buxton Feed Co. as long as they're making it! This letter was sent us from Kaya Diem.